Dorothy Gibbons is the CEO and Co-Founder of The Rose, a medical non-profit that provides high quality breast healthcare to women regardless of their ability to pay. 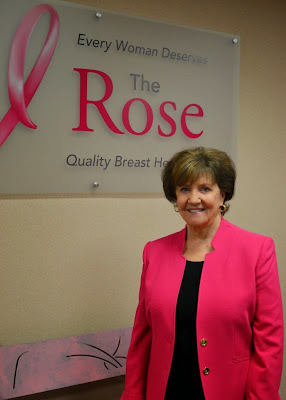 The first of its kind, Dorothy founded The Rose with Dr. Dixie Melillo in 1986. 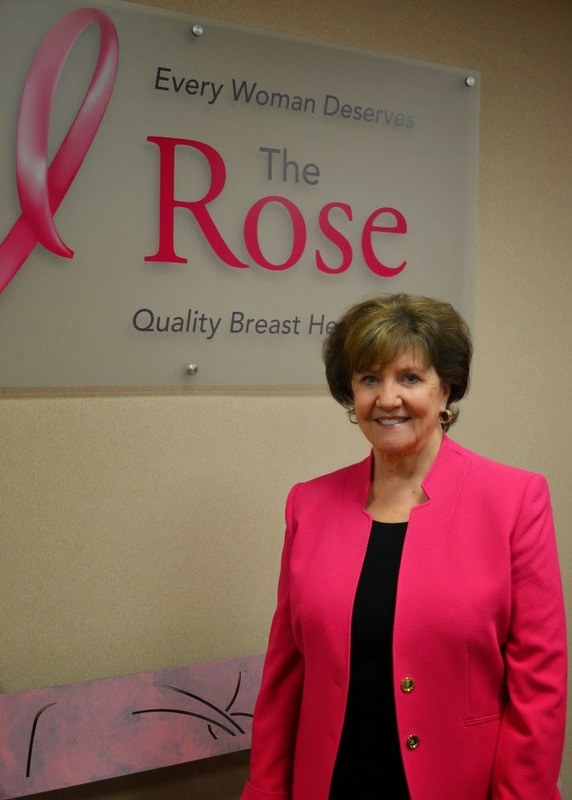 Each year, The Rose treats over 35,000 women, many of whom cannot afford to pay even $150 for a mammogram, let alone the thousands of dollars needed to pay for breast cancer treatment. Dorothy lives in Houston with her husband, Pat. I think if I were going to say something about myself, it would be that I am a great fan of women. I tell my employees that I am a feminist. It's not that I don't love men – I love my husband and my son, but I think if you're a feminist, you truly understand the value of a woman. People ask me what it is about The Rose that keeps me here. Am I a survivor? Do I have a family member who is a survivor? And the answer is no to both. Breast cancer is, of course, the focus of The Rose and has been for thirty years, but it's the women that we are serving, and the stories of those women, that keep me so passionate about this organization. I grew up in an environment where there was nothing but women around. My father left when I was young. We were very poor and living off relatives. Looking back, I see now what a strong woman my mother was, but as a child, you don't always see that. My mother died when I was twenty two years old from cervical cancer. The irony is that the Pap smear was out and available, but my mother didn’t have health insurance, and she didn’t know where to go even though she knew something was wrong. I remember her telling me that when she finally went to see a doctor, she had a douche that morning because the smell was so bad. Since I've been at The Rose, I’ve learned that smell was the smell of cancer, and that's a smell that you can't ever wash away. Back in the 1970s, I was in Public Relations at Bayshore Medical Center. It was the tenth largest hospital in the city, but it had only one female physician on its active staff, Dr. Dixie Melillo. She was a surgeon too, which was even rarer. One of the things that Dixie was so passionate about was breast cancer, and she campaigned for the hospital to have a dedicated unit. Back then they were still doing mammograms with a standard x-ray unit, the kind used for broken arms, and insurance didn't cover screening mammograms, something which just doesn’t seem possible now. 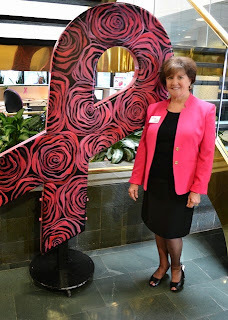 So Dixie and I started going to talk to women in the area, at civic clubs and so on, to promote the Bayshore Breast Center which offered a dedicated mammogram unit. We also went to the International Breast Cancer Conference in Miami and met Rose Kushner, who was there as a speaker. Rose was a journalist for the Baltimore Sun and when she found a lump in her breast, her doctor told her that if they found anything during her biopsy operation, they would tell her husband and immediately do a mastectomy without waking her up. They didn't have a two-stage procedure; they didn’t wake the woman up and tell her she had breast cancer, they just went ahead and did her mastectomy. Imagine the psychological impact on those women who woke up without a breast, it was horrendous. Well, Rose was not going to let that happen to her, but it took her sixteen doctors before she would find someone who would wake her first. After that, Rose would call me every Friday to ask what we had done about the non-profit, about calling our congressman, about getting Medicare to cover screening mammograms. Finally, we got our 501(c) non-profit status, and Dixie and I decided to call it The Rose as a living tribute to Rose Kushner. We also wanted to have a name that women would feel welcomed them when they walked in the door. more women in outlying counties. Now at The Rose, we can offer women a mammogram, ultrasound and biopsy, and we can also help them get access to treatment. We have Patient Navigators who guide them to a treatment program somewhere. Usually we can get them into Breast and Cervical Cancer Services, which is a state program, but the problem is that BCCS doesn't have a lot of money. It’s currently being reviewed in The Senate, which could mean that next year we get even less money. 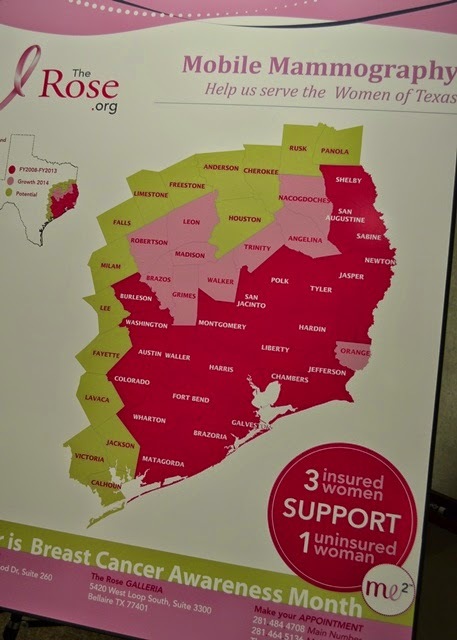 Sadly, because it’s all about women's health – and we all know the way our Texas legislature feels about women's health – we have a battle on our hands. I was in Austin four times last month, sharing our women’s stories and hoping that someone would listen. Thank goodness that State Representative Sarah Davis, herself a breast cancer survivor, is working in the House to protect BCCS, so perhaps we won’t have to face that next year. But the BCCS is just one program. Last year we diagnosed 350 women, and 260 of those were uninsured. Almost 150 of those went through BCCS, around fifty went through Harris County, and we have a few that could get into Methodist Hospital. In our outlying counties, sometimes we just have to work with the Physicians Network, with doctors who have agreed to help take care of these women pro bono. They won’t get care for every health issue, but at least they will get chemotherapy or surgery. When I was the PR person at the hospital, I was also the photographer, taking pictures of tumors and things like that. When I stood outside one of Dixie’s examination rooms, I knew what I was about to see was something that no one should ever see, and I could smell that smell that I had smelled on my mother. In the first year of The Rose, Dixie had something like thirteen women whose tumors had grown so big they had exploded through the skin, and were still getting bigger and bigger. I kept thinking, how could you live with something like this and not share it with your husband or family? It's got to be on your mind the whole time. How could these women have waited this long, because these women are not dumb. It's all about access to care, and they just don’t know there is anywhere they can go for help. And let’s be clear exactly who the uninsured are. I know people think it’s only homeless people who live under the bridge or in the park, but no. The uninsured are people like my sister, a single mother who couldn’t take a 25c an hour raise at her job because it would have meant that her diabetic son would have lost his Medicaid coverage. It’s people like the substitute school teacher that only works one day a week or the mother who can’t possibly justify spending $150 on a mammogram when she’s not sure she can afford to feed her children that night. So let's get real clear about who the uninsured are. And now we coming up against the myth that everybody has insurance because of the Affordable Care Act. Wrong. Because Texas did not expand Medicaid, half of the women that we sponsored over the last three years still have nothing. We also see a lot of young women who have invariably been misdiagnosed. They’re told it’s just a rash, or asked if they changed washing powder or deodorant, but actually it will be inflammatory breast cancer and it's very aggressive. Every year we have to raise about $3 million to take care of nine thousand women who walk through these doors without insurance. We take care of women with insurance as well, and those insured women give us a base so that we can open our doors and take care of the uninsured. We still have to raise money but they offset some of the cost. For every three insured women who come through our doors for a mammogram we can take care of one uninsured woman. We could do more free screenings, if one diagnostic exam was all that was needed, but by the time they come to us, many of these uninsured women are also certain to need ultrasound and biopsy too. I always tell my staff that until we don't see women with late stage cancer anymore, our job isn't done. I've been in Houston 64 of my almost 66 years, but you know, you can't claim to be a Texan if you're not! I was born in California, but my folks were from Texas and they moved back here. They had gone out there during the war, my father was older, so he didn't have to serve. He was working a lumber yard, then I came along and my sister came along, and we move back here to be close to my mother’s folks. I married young, but you know, it takes two to make a marriage and two to break a marriage. I’d been without any kind of true love for a long, long time, but I was sure in my heart that love still existed. So after I’d been divorced a little while, I decided that I was going to find my beloved, and I did. I manifested the perfect man for me straight out of the universe. First of all, I had to quit male bashing and putting men down. I also had to quit listening to my girlfriends and to all the women who were so tired of supporting men. Once I decided that I didn't want to live the rest of my life without loving someone and having them love me, I started off a ritual that I did every Friday. I started writing down scenarios about what it would be like to meet the perfect man for me. I opened my heart to love and to possibilities, and I made room in my life for another person. Before long, I started chatting online with a man in Canada, in a non-profit grant application forum. We talked over about eighteen months, just in friendship, we never even exchanged a picture. Then he called to say that he had a friend in Houston and he was coming to see this friend over Memorial Day weekend, and would I like to meet up? You know, I fell in love with Pat that weekend, and a few weeks ago, we celebrated twelve years married. Books. As a kid, I was always able to imagine something different, and I think that came from reading so much. No matter how hard things were, I was always able to go find a book and be somewhere else. You know, I get teased about having a PhD in Self-Help because I've read so many of those books, but still, I know that it is those books that can move you forward. It is those books that you can hold onto it when people let you down. The books are always there. I also know that I had teachers that pushed me to read beyond where I thought I could, to challenge myself. What advice would you give to someone new to the non-profit sector? I love to tell Rose’s story, because if you have something that you feel strongly about, and if there's a Rose in your life, it can make all the difference in the world. You have to find someone who's going to push you and who’s going to believe in you. And you have to believe in yourself. When I look back I know there was a lot of times we wished for a sugar daddy, or for some wonderful institution to come in and just give us all the funding we needed to go on. But do you think I would have the stories I have now if we'd had that happen? We sure would not be the same organization. I would also tell them that even though they run a non-profit, and it’s their life’s work, it must still be run as a business. If you have a year in deficit, you don't get grants because people don't want to take a chance on you, so you have to be a successful business to a certain level, though not too successful. It's like you're always walking this little tightrope. I journal every morning, though I think this life/work balance is a bunch of hokey. I don't think you can find that as long as you're working. Yes, I would like to have more balance, but most of the time, when it's your passion, it doesn't feel like working. But when I do need a break, I go off to the country and work in my garden. I love Houston. We now have a little country place, but for years I couldn't imagine living anywhere else but here. I love concrete and steel. I even love the traffic. It's that excitement and bustle, and folks don't realize how convenient it is to travel around the world from here. I can be in and out in no time from the airport, but I’m always happy to come home. I also love the diversity. I got to be part of the American Leadership Forum in Houston which is wonderful program. It changed my life, because as a senior leader with a few years behind her, it was easy to get caught up in always doing things the same way. But at ALF, you get thrown in with all these people who are business savvy, and you build relationships with them in a whole different way. You don't even realize that you've lost that skill over the years, but it can be hard for us as adults to create new relationships with other adults after we get so settled in our lives. I would seriously encourage anyone to do it. It's really my own backyard – and I mean that literally, with a spade in my hand – because if you can’t find happiness in your own backyard, then where can you find it? What's your favorite place to eat or drink? There's a wonderful restaurant at this end of the world called Cullen’s and I love that place. When we go into town, I love Seasons 52 on Westheimer. I love Indian food too, and we like to go to little bitty places, but I'm also very lucky that my husband cooks. I think he would prefer to eat at home anytime. I've been part of the Mary Magdalene community since 2005. This coming July at Christ Church Cathedral, we are having the Magdalene Festival, organized with Brigid’s Place. We are inviting artists to come and re-image Mary Magdalene. Myths were created in the Middle Ages that Mary Magdalene was a prostitute, the penitent whore, but that was a total lie. So we are inviting artists to bring us a new Mary – Mary who was a teacher and Mary who was the apostle to the apostles. After all, Mary was probably the reason why Jesus’s community could function, and without Mary Magdalene we wouldn't have Easter. She was the sole eye-witness who watched him be put on the cross, taken down again, and who followed the body to the tomb and stayed there all night. Her name was the first name spoken by the resurrected Jesus. But I don’t think that this sort of event could happen in many places except Houston. Believe me, there's a lot of people who think we shouldn’t even be talking like this, but that’s what is so wonderful. This is a city that will allow this idea to be discussed, that has a church that's open to hosting it, and that has a strong artistic community to draw on. Billboards. Our buildings are so beautiful, but the billboards just get in the way. 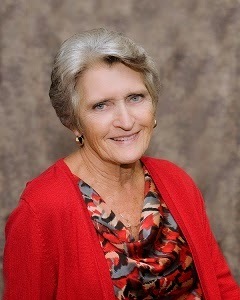 Marian Sparks is a sky-diver who does an annual event – Jump for The Rose – to raise funds for us. But she is so much more than that. Marian was one of our sponsored women. She was divorced and as a result, she didn't have health insurance anymore. She got a mammogram paid for through the American Cancer Society, and when it came back with a problem, she came here to have her ultrasound and biopsy, and we got her into treatment. Since then, she has done her skydiving event once a year and so far she's raised more than $85,000 for us. I even tandem-jumped with her one year! Marian’s life has been so full of challenges, but still she has this event for us so that we can take care of others. She is a very special woman, but her circumstances are typical of the women we see at The Rose. A woman lets her career slide when she has children, but then loses her health insurance because of a divorce. It’s tragic. We just never know what is going to change our lives in the blink of an eye. For more information on Dorothy’s work at The Rose, or to make a donation, visit the website here. For more information on The Many Faces of Mary Magdalene art event, visit the Brigid's Place website here. If you would like to join in the Jump for the Rose, visit the website here.